I recently caught up with Tricalee Riley, owner of Myrtle Avenue's Polish Bar Brooklyn, to find out more about the inception of her business and why she loves Clinton Hill. How long have you lived in the neighborhood, and what brought you here? I have been a Clinton Hill resident for 2 years. I love it because it is authentic, it wasn't created... it's a real community, with real people... real families and everyone belongs. What's your favorite thing about it? the unpretentious people and the Pratt students... they keep me young and hip. 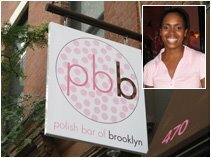 How long have you been planning to open Polish Bar, and what gave you the idea? 7 years. The idea came from being disappointed with the options in inexpensive nail salons; a part of my weekly routine. Sometimes you feel like you can do something better than it's currently being done. It was one of those situations. My makeup background brought the other facets of the business into the plan. So I started documenting my ideas (daily) about 5 1/2 years ago. I started my business plan in 2004. Any unexpected hurdles in opening your own business? Yes, too many to count. I've learned to spend 5 minutes on defining the problem and the remainder of time on RESOLUTION. What sets your shop apart from other area salons? Simple. We're a customer based business. Every decision we make as business professionals puts the customer first. We are continually looking to improve the service, the products, and the overall experience. I believe as long as we remain committed to this, we will continue to grow as a brand. We're improving day by day. Did you use any local organizations' resources in opening the salon? (MARP, PCC, etc) I met with MARP to introduce the business and get some feedback on my storefront design. Luckily, they were pleased with everything I wanted to do and very supportive. I could have used more resources, and now that I’m open I plan to reach out for help. What's your background, professionally? Beauty? Business? I worked in cosmetics for 10 years. I managed makeup artists, retail stores and opened freestanding stores for cosmetic companies. I have 7 years in Business Management and 11 years in makeup. My experience ties directly into this venture and has helped in the transition. Do people, um, think that the name of the salon is Polish, as in Poland? I myself misread it, as did many others. Any funny stories about that? LOL... truthfully, they're aren't any funny stories. I came up with the name 5 years ago, so I've heard Polish Bar... (as in Poland) over and over again. People come in a dozen times a day and say, "I thought this was a Polish Bar..." They laugh and I try to laugh too, but it's so hard. I would compare it to, "knock knock... who's there?" I want to laugh, but there's nothing left. But I get it, and still I was adamant about the name, even though I knew it would confuse people. I spent many nights inside of the shop listening to neighbors and their excitement about a new bar opening. I guess that's why I felt compelled to offer cosmos at my Grand Opening. I guess I felt a bit guilty. Favorite place to eat in Clinton Hill: so my typical day is breakfast at Cafe Martino, lunch from Pillow Cafe or Smooch... then take out from Thai 101 or Zaytoons. They are all my favorite. I spent a lot of time at these places when I was planning my opening. What's your greatest wish for the neighborhood? That's too hard... so many things. Hopefully more small businesses will open, new restaurants, lounges, clothing shops, etc... I do want change for Clinton Hill, but I hope the people remain the same. If you were a flavor of ice cream, what flavor would you be? I would be Neapolitan. Something for everyone to love.